So After Nokia and T-Mobile announced the Lumia 810 we can now get to see the first hands on video featuring the Lumia 820 variant courtesy CNET. We now get to see first hand what the physical appearance of the 810 looks like. At first it almost look like she is holding a black mirror, what's up with that? 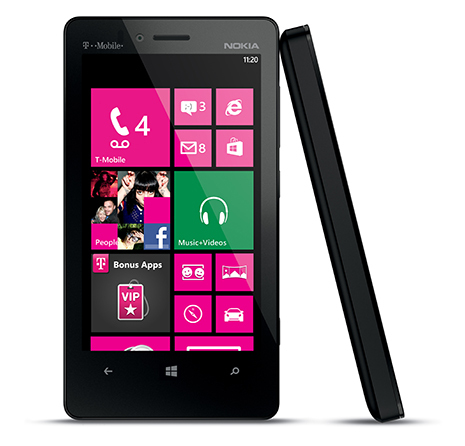 oh and might I add… the screen is huge (4.3inches), I know it's the same with the Lumia 900, but I think it's wider. We don't get to see the custom T-Mobile WP8 OS as Microsoft has put a lock on all hands on with WP8 until they official launch it on Oct. 29th. But it is fun to see that you can buy different shells (like the Cyan version demoed in the video) also with wireless charging. It's also interesting to see the camera design is the same as that on the Lumia 920 and the earlier 800 and 900.